Life feels rather rigid and unyielding sometimes, which is why it’s nice to have art like Jan Kriwol‘s into which we can escape momentarily. Kriwol’s series “Paper Realities” only consists of three photographs, but they are remarkable for their realism and their fun treatment of fantasy. In all three of the photos, the photographer has made the world appear as no more substantial than a piece of paper. 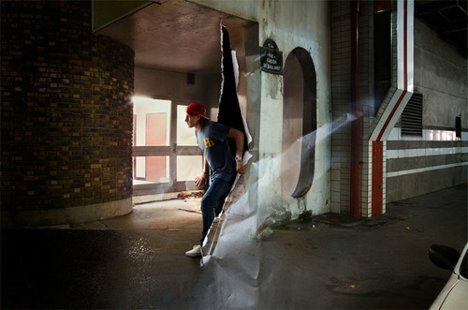 A young man casually breaks through a split in the very fabric of space/time in one picture. 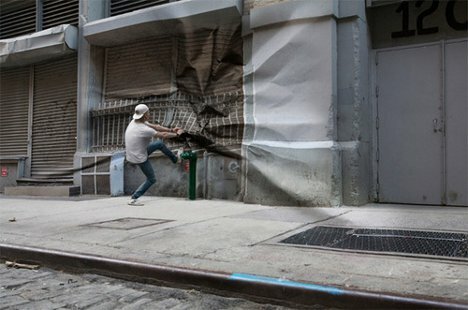 In another, a man’s powerful jump has caused wrinkles to appear in the paper world. And in the third, a disgruntled figure pulls angrily at a locked storefront, causing sharp wrinkles to appear all around. The photographs are simple enough, but they reflect a desire that nearly all of us have had at one time or another: to reach out and change reality. 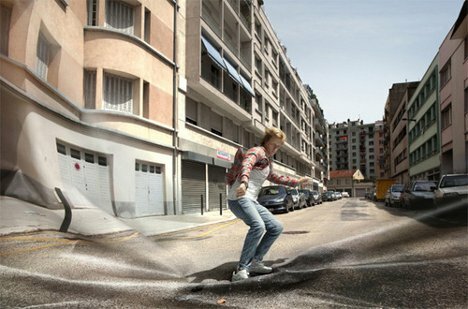 Kriwol’s characters do just that by interacting with their surroundings as if they were no more substantial than a parking ticket.